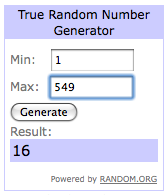 mon petit lyons: SMS Giveaway Day Winner! Thank you all for your overwhelming response to my Sew, Mama, Sew Giveaway Day! I tried to make it easy on you, and not make you jump through too many hoops, but it looks like I have gained a few new followers. Thank you for that. Since I passed the 250 mark, I think I'll have another giveaway to celebrate, so stay tuned. In the meantime I hope you enjoy my blog. I do try to answer comments, but it was hard to do that with everyone for this post. I did read them all and appreciate the clever ideas you gave me for entertaining my kids this summer! This bundle is coming your way next week. I hope you enjoy! And I hope you enjoy yourself on your pontoon this summer! Thank you, thank you, thank you Courtney! I love the fabric and will have such fun making a quilt for grandbaby!